powerHouse Cultural Entertainment, Inc. was formed in 1995 by Daniel Power as an entertainment company using books as a foundation for creative expression and presentation across as many platforms as feasible. While those CD-ROMs never got off the ground, the organization became something of an inverted pyramid, books being the base (pinnacle) of contemporary modes of entertainment consumption. We never really got beyond books, but we've expanded the base—which started with powerHouse Books that debut year—to include The powerHouse Gallery (2003-2006, site of our previous location the city); The POWERHOUSE Arena (est. 2006), The New York Photo Festival (co-founded, 2008), powerHouse Packaging & Supply (est. 2011), and POWERHOUSE on 8th (est. 2012). 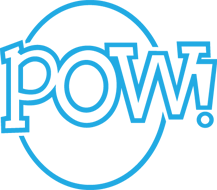 Oh yes and starting in 2013, POW!, a children's and novelty book publishing programme. powerHouse Books, world-renowned and critically acclaimed publisher, is best known for a diverse publishing program—specialized in fine art, documentary, pop culture, fashion, and celebrity books. Home to world-renowned art book publisher powerHouse Books, the Arena is a gallery, boutique, book store, performance, and events space located at 37 Main Street, in New York City's scenic DUMBO neighborhood. POWERHOUSE on 8th is a brand new bookstore, reading club, mini-gallery, and community space bringing South Slope the best in fiction, non-fiction, kids, YA, novelty, cooking, decorating, stationery, and more, all from the curatorial minds hived at Dumbo's famed POWERHOUSE Arena. An imprint of powerHouse Books, POW! publishes visually driven, imagination-fueled books for kids. Our projects combine an offbeat or humorous sensibility with outstanding design to make books that delight children and grown-ups equally. powerHouse Packaging & Supply, Inc. is a book producer and co-edition publisher of innovative, stylish books and book-plus products for both the adult and children's markets.